The Centre for Molecular Biology and Neuroscience (CMBN) (Senter for molekylærbiologi og nevrovitenskap) is a Norwegian Centre of Excellence at the University of Oslo and Rikshospitalet, Oslo University Hospital. CMBN shall take on a leading role in elucidating the role of DNA repair and genome maintenance mechanisms in preventing neurological disease and brain ageing. 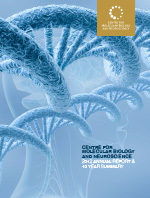 The CMBN Annual Report 2012 and 10 Year Summary s now available. The Centre for Molecular Biology and Neuroscience (CMBN) has come to an end and this website will no longer be updated. For information about the research carried out in the research groups that comprised CMBN, please see the websites of UiO and OUS as well as the websites of the individual groups. Best wishes for 2013 to our collaborators and all visitors of the website! Methylation of mammalian DNA and histone residues are known to regulate transcription, and the discovery of demethylases that remove methylation in DNA and histones provide a basis for the understanding of dynamic regulation of mammalian gene expression. Knowledge on these demethylases has led to a tremendous progress in the understanding of methyl marks in gene regulation and role in numerous diseases. In mRNA, the methylation of adenosine (6meA) is particularly interesting since it is the most abundant internal modification. The first mRNA demethylase, FTO, was identified recently and 6meA was shown to be a substrate for FTO. Genome-wide association studies have identified a firm link between the human FTO gene, obesity and type II diabetes. 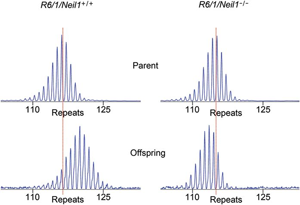 In a collaborative study, Dahl (Picture) and colleagues, together with collaborators at the University of Chicago and Beijing, show that ALKBH5 is a second demethylase for 6meA in mRNA (see figure below) and that mice lacking this demethylase are infertile. Together, the discovery of two proteins that can reverse 6meA modifications from mRNA draws attention to the potential regulatory functions of reversible RNA methylation and the role of 6meA in disease. Insights into the mechanism of this process may well open up new horizons and opportunities for basic as well as translational research. The Norwegian Biochemical Society (NBS) Contact Meeting 2013 will he held at Lillehammer, Norway, 31 January to 3 February 2013. The meeting gathers scientists within the fields of biochemistry, molecular biology, immunology, genetics, biotechnology and related fields in Norway. Twelve invited plenary speakers have already confirmed that they will participate at the meeting: Steven A. Benner, Eric C. Greene, Adrian Hayday, Leroy Hood, Kristian Helin, Pier Giuseppe Pelicci, Gregory A. Petsko, Anne Simonsen, Ludvig M. Sollid, Dan S. Tawfik, Kevin P. White and Reidunn B. Aalen. A biotechnology session with emphasis on innovation will be held on Saturday with invited speakers Øystein Rekdal from Lytix Biopharma AS, Berit Johansen from Avexxin AS, and Pål Kristian Selbo from PCI Biotech AS. The meeting is organized by NBS members at Oslo University Hospital. The registration and abstract deadline is 1 December 2012. For more information, please visit the NBS Contact Meeting 2013 website. The article shows that doses of anesthesia insufficient to affect neuronal responses to whisker stimulation suppressed astrocyte calcium signals. The CMBN 10 year summary report is now available. On 18 October 2012, CMBN will celebrate its 10 years with a presentation of highlights from its research achievements. The event will take place from 1000 in the Rotunda of the new Domus Medica II (DMII) annex. All are welcome! Please see the programme (PDF) for details. AlkB homolog 1 (ALKBH1) is one of nine members of the family of mammalian AlkB homologs. 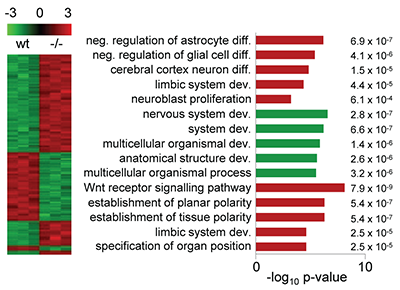 Most Alkbh1 deficient mice die during embryonic development, and survivors are characterized by defects in tissues originating from the ectodermal lineage. In this study, we show that ALKBH1 is a histone dioxygenase that acts specifically on histone H2A. Further, we demonstrate that deletion of Alkbh1 in embryonic stem cells leads to upregulation of the core genes involved in pluripotency and that ALKBH1 is required during early differentiation. Our results suggest that ALKBH1 is involved in neural development by modifying the methylation status of histone H2A. Two CMBN groups have identified a DNA repair gene that modify somatic and germline CAG trinucleotide repeat instability in the Huntingtin gene. Huntington's disease (HD) is a progressive neurodegenerative disorder caused by a CAG:CTG repeat expansion in exon 1 of the gene that encodes the polyglutamine-containing protein Huntingtin. It is shown here that somatic CAG expansions are significantly reduced in several organs of R6/1 mice lacking exon 2 of Nei-like 1 (Neil1). This study further confirm a role of oxidative DNA damage and neurodegeneration. We previously identified (with Cynthia McMurray's group at the Mayo Clinic, Rochester, MA, USA) a role of 8-oxoguanine-DNA glycosylase (OGG1) enzyme in initiation of age-dependent CAG trinucleotide expansion associated with Huntington's disease that occurs in somatic cells. (Kovtun et al., Nature 2007). 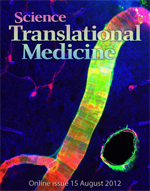 CMBN scientists have co-authored the cover story of the current issue of Science Translational Medicine. The article describes paravascular pathways that others call the superhighways or hidden sewers of the brain. 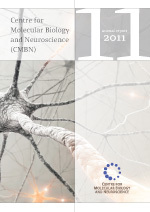 The CMBN annual report 2011 is now available. Are stiff muscles good for your brain?